Walnuts are nutritious may be an understatement, they are superfood! And to an extent that it’s been 50 years that scientists and experts have an annual conference at the University of California just to discuss latest benefits that walnut has for you! They are a must-have in your diet. From boosting your mood to improving your brain and from keeping your heart healthy to a healthy gut, what is it that they can’t do! Well, we don’t know that but what we do know is that there are some science-backed benefits that will reinforce the power of this humble nut. Reduces the risk of certain cancers: Walnuts not only reduces the risk of prostate cancer, but breast cancer as well. In one study, mice were given to eat 68g of whole walnuts (equivalent to humans) for 18 weeks and it was seen that the mice had noteworthy smaller and slower-growing prostate tumours those who ate same amount of fats from other sources. The whole walnut diet decreased the prostate cancer growth by 30 to 40 per cent. In another study on mice, the human equivalent of just two handfuls of walnuts every day slashed the breast cancer risk in half and slowed the growth of tumour by 50 percent. Promotes heart health: Walnuts contain the l-arginine, the amino acid that has multiple vascular benefits to people with heart disease, or those who have higher chances of heart disease due to multiple cardiac risk factors. Plant-based omega-3 fat alpha-linolenic acid (ALA) is another anti-inflammatory that may prevent the formation of pathological blood clots. One research showed that people who eat a diet high in ALA have a reduced risk of coronary heart disease. Works on age-related deterioration: Presence of some rare and powerful antioxidants in walnuts combat free radicals and help in controlling ageing. Antioxidants such as quinone juglone, the tannin tellimagrandin, and the flavonol morin scavenge radical elements in your body. Multiple researches have shown that walnut polyphenols may help prevent chemically-induced liver damage. Controls weight gain: Adding walnuts to your diet can help you to maintain your ideal weight over time. In a review of 31 trials, it was noted that people whose diets included extra nuts or nuts substituted for other foods lost about 1.4 extra pounds and half an inch from their waistline. Eating walnuts is also associated with increased fullness after just three days. 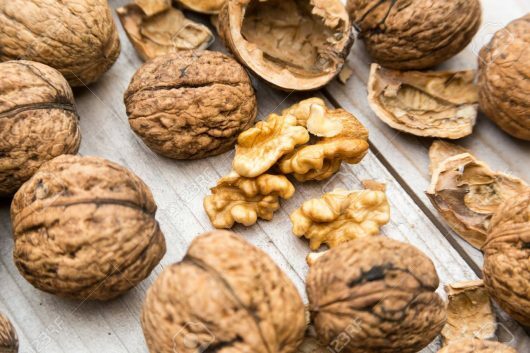 Improved reproductive health in men: One of the lesser-known, and may be the best for men, benefits of walnut is its positive impact on male reproductive health. For men who consumed a Western-style diet, adding 75 grams of walnuts daily significantly improved sperm quality, including vitality and motility.